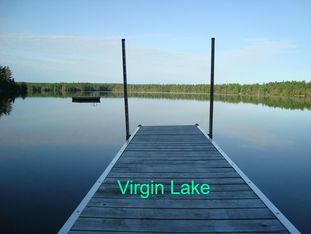 ​Our Lakeview Chalet has a view of Dempsey Lake (Virgin Lake) on a 1 acre very private and quiet dead end road. Virgin Lake is very private cottage locked lake with no access to public thus a very tranquil lake with boats no larger than 9.5 HP allowed. Calabogie is a small village in the Ottawa Valley of Eastern Ontario, Canada. All our Chalets are non-smoking. We are 10 minutes to Calabogie Peaks Ski Resort, Calabogie Lake & 5 minutes (5 Km) from Calabogie Motor SportsTrack. Please view our pictures and note we are not directly on the water but across a dead end road up a hill from the Lake. Our Lakeview Chalet has a view of Dempsey Lake (Virgin Lake) on a 1 acre very private and quiet dead end road. Virgin Lake is very private cottage locked lake with no access to public thus a very tranquil lake with boats no larger than 9.5 HP allowed. Calabogie is a small village in the Ottawa Valley of Eastern Ontario, Canada. All our Chalets are non-smoking. We are 10 minutes to Calabogie Peaks Ski Resort, Calabogie Lake & 5 minutes (5 Km) from Calabogie Motor Sports Track. Included with Cottage Rental guests supply their own linen, towels, food and personal items. No maid service is provided. Our Calabogie cottage accommodations are available for rent year round. Our Chalet is well equipped and supplied unlike many cottages. Highlands Golf 5.6 KM from the Cottage. All our beds are new top of the line mattresses. Ask about your pets. Dogs only (sorry too many people allergic to cats.) Our cottages are pet friendly. Pets must be kept on property (not allowed to roam). When off our property keep pets on leash. Keep dogs off the furniture. Clean up is expected. Guests supply their own linen, towels, food and personal items.